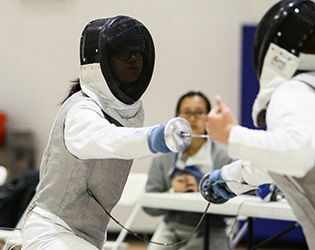 The varsity fencing team competed in the Prep B championships on February 13, with the girls’ epee squad finishing in third place for the fourth consecutive year. Boys’ saber also finished third, with senior sabrists Landon Braemer and Luke Solondz advancing to the individual rounds. This weekend, sophomore Brianna Moglianesi took part in the 2017 Junior Olympics in Kansas City, Missouri, fencing epee in the cadet group (ages 14-17). At Gill, Moglianesi is in her second year with the varsity fencing team. In 2016, she won a gold medal for epee in freshman competition at the Montclair Frosh / Soph Invitational. This year, she garnered a silver medal in the sophomore event. Moglianesi enjoys the strategic dimension of the sport. "I am a very patient fencer.” she said. "I don’t attack unless absolutely necessary. I wait to counter. It is an especially helpful tactic for defeating newer fencers. They just go at you. They don’t think it through." The Knights will round out their season with the Zanko tournament at home later this week. Congratulations to all of our fencers. Go Knights!